In the wake of the Paris attacks, the world is a suspicious place – is paranoia the new normal? 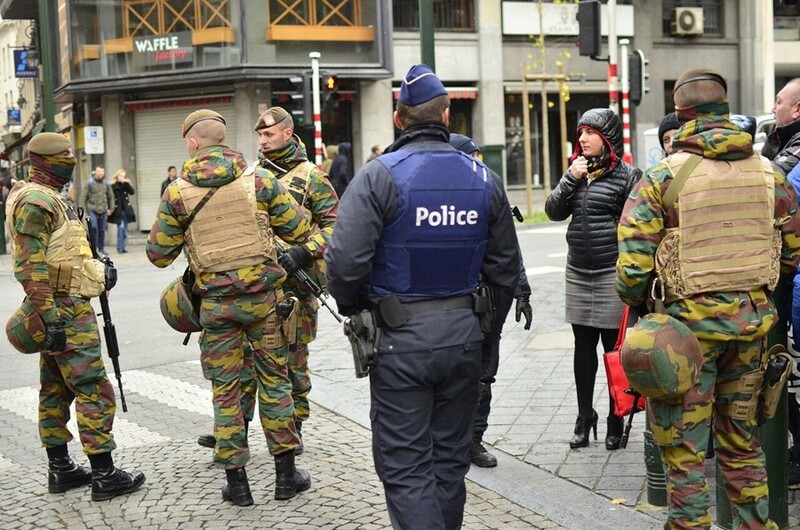 Brussels, you’re probably aware by now, is a city on lockdown. There are police on every corner, and soldiers on every other corner. The metro is shut, as are schools, universities, cinemas and music venues – though many offices and places of work remain open. The sound of sirens rings out across the city at all hours. Yet get off the busier boulevards, away from the tourist hotspots and the high-profile shopping districts, and life carries on. Corner stores and inner-city supermarkets remain open. Many bars and restaurants are serving, though not nearly as full as they would be on a normal day. These stubborn patrons look as uneasy as the servers do. It feels like a Sunday morning that's gone on for days on end. Then the paranoia returns and you remember what's supposed to be happening. A significant number of the terrorists behind the butchery in Paris two weeks ago were from Brussels, from the newly infamous Molenbeek neighbourhood, and a survivor of that group is now on the loose. Additional terrorists are allegedly planning similar attacks against targets within the city. Over the weekend, most remained shut indoors, committed to drowning out the nagging fear with the the myriad entertainments that keep us happily atomised in the 21st century. If you didn't read the newspaper – or scan social media – you wouldn't have much inkling of what was going on, and even then you wouldn't have much more information. Something is happening. The threat is imminent, the authorities warn us, and in light of current events there's not much reason to doubt them. The specifics remain vague, and as the lockdown continues (at the time of writing, it is set to last until next Monday), it's hard not to feel frustrated. And then to feel guilty about feeling frustrated: two weeks ago in Paris, 130 people just like myself died, so what does it matter if I can't go to the gym, or I can't go to the multiplex to watch the new Hunger Games film? Better a severe over-reaction from the authorities, than risk anything remotely similar. When you pass soldiers in the street, most nod their heads at you or smile, a conscious effort to relax citizens. But this isn't normal. It's also not a real crisis. Nothing has actually happened, no violence has occurred, but the possibility lingers in the air. Brussels is paralysed in a surreal – yet muted – stasis. The most serious inconvenience that's so far occurred is for those struggling to find childcare during working hours. When you walk down the street every loud noise causes you to look over your shoulder, and you begin to daydream about possible escape routes when traversing busy public spaces. At my nearby LIDL supermarket, security guards search everyone's bag before letting them enter. I went to a pizzeria on a small square on Saturday – a small act of defiance, but it quickly began to feel like a foolish bit of bravado. I refused to sit too near the windows, and quickly finished my meal, before scurrying back to my flat, where I could block it all out with a hefty dose of Netflix and PS4. An EU bureaucrat friend drinking in a nearby bar reported that a joker burst in shouting “ALLAH” at the top of his voice, before sitting down to drink. It's a small miracle the man wasn't murdered. Strong Belgian beers make everyone more forgiving. This is the most dramatic event to happen to anyone I know during the Brussels lockdown. Everyone is constantly receiving worried messages from distant friends and long-forgotten acquaintances sending concerned messages, promises to pray for us and so forth. It only adds to the surrealism. I sat indoors and watched Babe on Netflix. What's the big deal? From the outside looking in, Brussels looks like a warzone, but from the inside, it’s more like a national holiday, the odd pair of soldiers patrolling in the street are the only visible difference. It turns out I have to go to work if I want to get paid. Friends ask if I'm out of my mind: "Is your life worth the risk?" they ask. What else are you supposed to do? The morning walk to the office is tense. I joke with my flatmate to prepare for a "Mad Max-esque apocalyptic battle on the roads," before he gets on the bus he needs to take. By evening a sense of normality begins to return, but the paranoia floods back at the slightest provocation. A teenager sprints past me at full pelt, as I walk past the European Parliament. My heart skips a beat, and then it turns out it’s nothing, and I feel vaguely embarrassed. There are plenty of ways to rationally consider the threat of terrorism. In terms of probability, there are plenty of far more mundane ways in which you're much more likely to die. Terrorism is a tactic intended to instil fear, to lead to an overreaction viewed as strategically beneficial by the perpetrators. Isis's apocalyptic ideology may be irrational madness, but sadly they’re not stupid in how they go about their crazed aims. By refusing to give in to fear, you deny the terrorists what they want. But thinking rationally about risks and not giving in to fear is hard in light of current events. Nothing has actually happened in Brussels, no one was hurt, no one has died. It feels distasteful to be too upset over these minor daily inconveniences in light of that. But it could happen, maybe it almost did happen. It's hard to not think about that. It's hard not to eye every passing car, and every hooded stranger with suspicion. How long will this last? Is this the new normal?